Under automotive development policy 2016-21, the Government of Pakistan has awarded category-A Greenfield Investment status to KA Hanteng Motor Company Pvt. Ltd. to set up an assembly plant and start manufacturing commercial vehicles. The automaker is anticipated to bring an investment of about $50 million for the local auto sector. M/s KA Hanteng Motor Company (Pvt) Ltd., has collaborated with a famous Chinese car maker M/s. 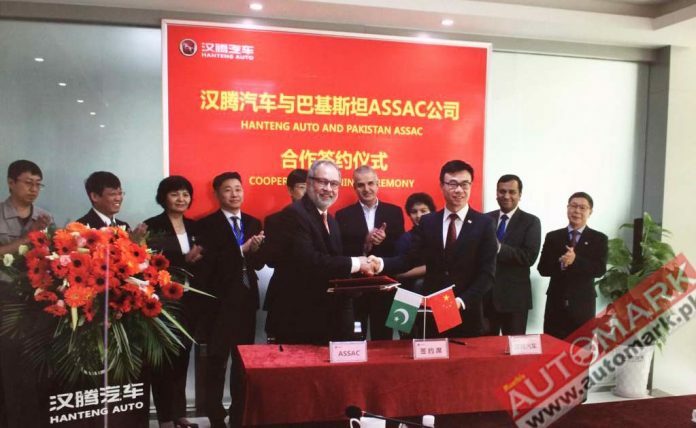 Hanteng Automobile Co. Ltd., to initiate manufacturing passenger cars & SUVs. The agreement between both companies was signed in May 2018 in Shangrao, China and it also includes technology transfer, manufacturing of electric and hybrid vehicles. Automark has verified this news from the company representative and the joint venture is all set to establish an assembly plant at M3 Industrial Zone in Faisalabad with a capacity to build 15000 units annually. The local compay from the sports industry of Sialkot. The company has also revealed its plan to introduce Hybrid Cars & SUVs in near future. • M/s KA Hanteng Motor Company (Pvt) Ltd shall strictly adhere to the conditions mentioned in Notifications No. 2(9)/2013-LED-II dated 2nd June 2016. • EDB will issue manufacturing certificate and list of importable components after it verifies that the assembly/manufacturing facilities developed by the company are sufficient enough to produce quality and roadworthy vehicles. This agreement shows increasing trust of Chinese private companies in Pakistani auto sector, economy, and investment opportunities. The joint venture will further strengthen the relationship between two countries through industrial cooperation and economic growth which is a step ahead in the CPEC project.